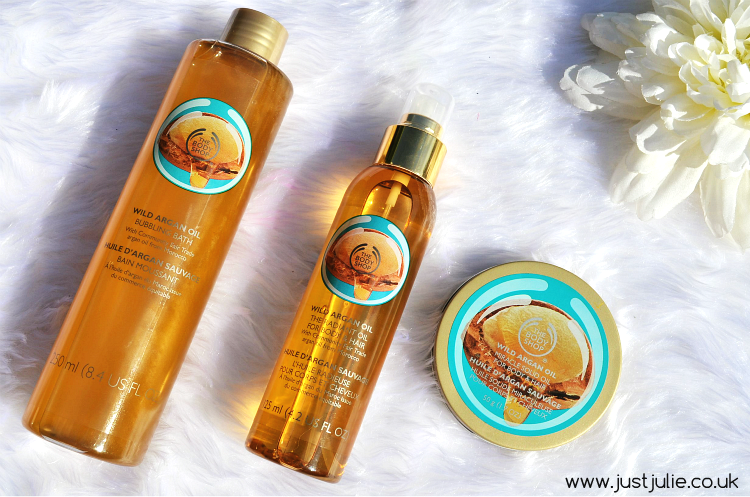 The Bodyshop NEW Wild Argan Oil Range! A few weeks ago I attended an event for The Bodyshop in conjunction with Rakuten Marketing who run the Linkshare Affiliate program. The afternoon was fabulous and we got to see lot's of new products from The Bodyshop and was given a goodie bag which included three of the New Wild Argan Oil range. Argan Oil has taken the beauty world by storm over the past few years, I myself swear by argan oil for my hair and have been using various different brands for nearly two years and the difference I've seen is amazing. I hadn't, up until recently, used any argan oils for anywhere aside from my hair, so when the team at the event were talking about their new range, I was so excited to see that I had three of the products included in my goodie bag. 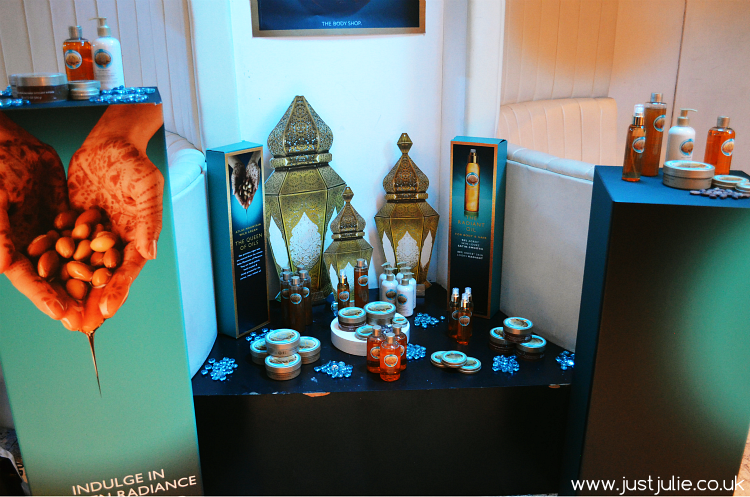 The New Wild Argan Oil Range from The Bodyshop consists of 9 products, all for the bath and body. We tend to associate argan oil as a hair treatment, but this oil is so luxurious and is amazing at nourishing the skin, I think it's great that they have decided to make a bath and body range using this. I wanted to share my thoughts the three products I received after using them for a few weeks. I rarely get the time to sit back and really relax in the bath, it's something I should do and where I've been so busy lately, I've been making sure that I have a really relaxing bath twice a week where I light a few candles, take in my iPad to watch a TV show or listen to music and just lay back and relax for an hour. I run my bath and pour in a small amount of the Bubbling bath and immediately my bath room is full of this beautiful argan oil aroma and feels so spa like. A small amount is all that is needed to produce a bath full of bubbles too, so this will last you a long time! The bubbles don't disappear after ten minutes like some of the bubble baths I've tried recently either and remain for the duration of my hour long bath, which is what I want a bubble bath to do! 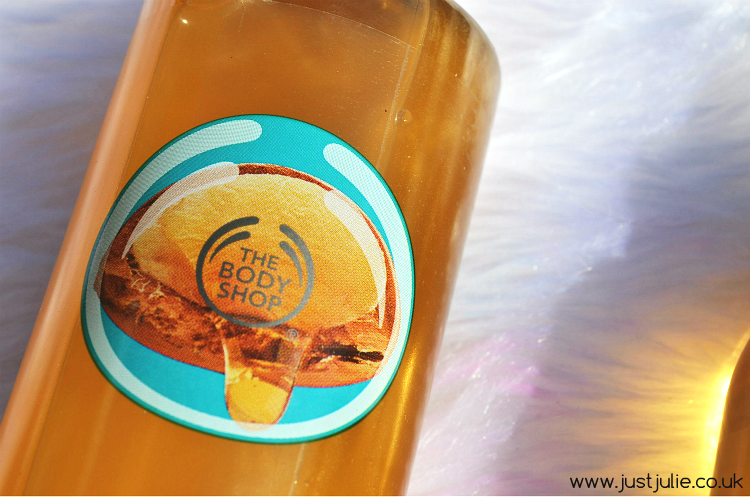 This also leaves my skin feeling silky soft and the scent lingers on my skin for several hours afterwards. This only costs £8.00 for 250ml, which makes it great value for money as I haven't even used a quarter of this up in the four weeks that I've been using it! I now really look forward to my relaxing bath night and will be repurchasing this once it's all used up too. As I said, I love Argan oil for my hair, the Radiant oil is for the body and hair, so I was pleased when I see this could be used in multiple ways. As a hair treatment, it's amazing. I spray a tiny bit into the palms of my hands then massage it into my freshly washed hair. You need to be careful with this, it's easy to want to use more, but I use four sprays and that's enough to use in my hair. You can also use this when your hair is dry, but I recommend using just one spray (two maximum) otherwise you'll end up with greasy hair! This leaves my hair feeling silky soft and adds a slight shine. This is also amazing to use on my hair extensions too. I will probably not repurchase my current argan oil hair treatment by Redken and opt for this in the future. As a body oil, it does a really good job at moisturising my normally dry skin. I've always used body creams and not used many body oils before, so I can't compare what this is like to other body oils, BUT so far this has been doing a great job. Coupled up with using this after I've had a bath using the Bubble bath, this really helps to keep the scent on my skin even longer. This costs £14.00 for 125ml, a little more than what I'd spend on a body product BUT as this can be used on your hair too, it's actually a lot cheaper than the Redken Argan oil that I currently own. This is the first time I have ever used a solid oil. If you see how long my nails are, you'll know why I tend to opt for products that I don't need to stick my fingers into, it's really too much of a chore for me! Having said that I have been using this on my dry elbows and this has done a fantastic job of keeping them moisturised and it's now a must have treatment to do prior to fake tanning! No more orange elbows!!!! You can use this for your hair, body, face, basically anywhere that you have dry skin, you can also use this on your nails and cuticles too! I do like this but it's not something I'd repurchase, purely because I like the simplicity of just spraying or squeezing out a product. This only costs £8.00 and will last a long time, so if anyone out there loves a solid oil then I would recommend you give this a try. Overall I really love the three products from the new Wild Argan Oil range and will be buying the Wild Argan Oil Shower Gel which is only £4.00 and the Wild Argan Oil Body Lotion which is only £8.00 from the range to complete my argan oil bath ritual! I was sold on Argan oil for my hair and now I'm sold on argan oil for my bath and body too! I love that the prices are really good too, so you don't need to spend a fortune to have a luxurious bath and body routine! 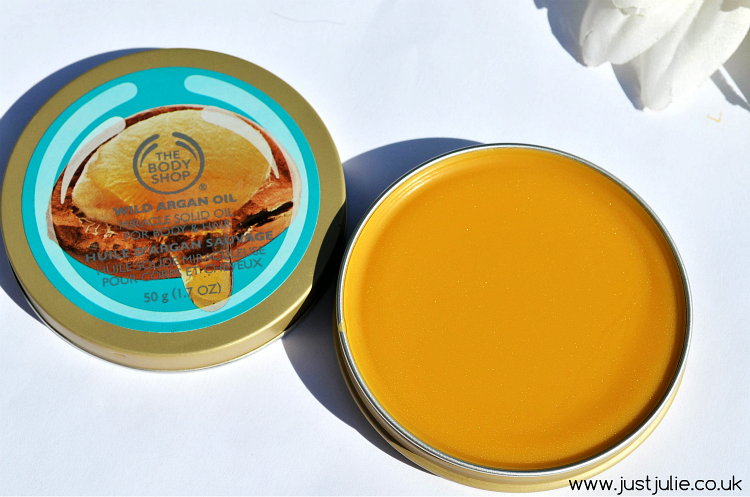 Have you tried the new Wild Argan Oil range from The Bodyshop yet? * I received these products from an event but have written about them on my own accord. This post includes some affiliate links. JustJulie has been shortlisted for the 'Best New Beauty Blog' category in the 2014 Cosmo Blog Awards. If you enjoy my blog you can vote for me to win just HERE Please ensure you keep pressing NEXT until you can input your name and email. Only then will your vote be submitted. Voting closes 29th August.